Deliciously moist and full of the rich flavors of autumn, this pumpkin bread will be the perfect way to welcome fall. If you don't want to bake quite yet, just pin it to make on that first cool day when the leaves have started to turn. Pumpkin bread would make a fun treat for the kids when they rush home from their first day of school. Enjoy a couple of slices and a glass of cold milk while you get all the school-day news. 1. Spray two 9X5 loaf pans with cooking spray. Set Aside. Preheat oven to 350 degrees. 2. In a large bowl, combine the flour, sugar, soda, salt, baking powder, and spices. Whisk to combine well. 3. In another large bowl, combine vanilla, eggs, pumpkin, oil, water, and nuts. Mix thoroughly. 4. Stir pumpkin mixture into flour mixture, stirring until just combined. Do not over-mix. 5. Divide batter evenly between the two prepared pans. Bake for 60 to 70 minutes or until toothpick inserted in the center comes out with a couple of moist crumbs attached. Let pan cool on wire rack for about 15 minutes, then remove bread from pan. Cool completely on wire rack. Store tightly covered. The bread in my darker metal pan was done at about 59 minutes. The bread in the clear Pyrex was done in about 70 minutes. There was a little more batter in the Pyrex pan, too. Pumpkin Bread may have been taken to some of these fun parties. Oh boy, now I'm really itching for fall. I love Pumpkin everything! Stopping by from Busy Monday, thanks for sharing! Pumpkin bread is the absolute best! Pinning this! I would love to have you link it up to my Feature Friday Link Palooza! The pumpkins bread looks wonderful. I have copied the recipe so I am already for fall, in more ways than eating pumpkin bread. I have already made some and it was so good. Will try your recipe next, thank you so much. Thanks for sharing! I will try this! My gosh! This looks so delicious. I am ready for Fall. I truly love pumpkin bread. That is one of my favorite things about fall. Thanks for sharing your recipes. It looks super moist and delicious. Love pumpkin bread...heck love most things pumpkin! I can't wait for all the fall food ! Yum! Pumpkin is just about the only thing I look forward to in the fall! Oh my, Joy, this looks simply delectable and beautiful! After lemon, pumpkin is the favorite flavor at my house and this is on the must-make list for fall! Pinning and sharing! Thanks, my friend! Oh how amazing does this look! 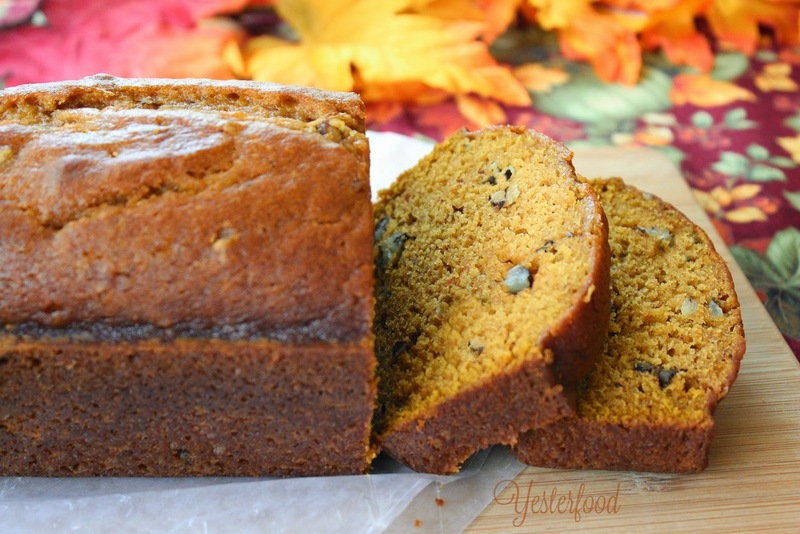 I LOVE pumpkin, so bring on the many recipes :-) Pumpkin bread...yes please! As much as I love Spring and Summer, Fall has the best seasonal flavor with pumpkin!! I can't wait for bloggyland to be in a pumpkin explosion! :) We'll have company this weekend - I may need to make this pumpkin bread for them to snack on! Slices of this bread would be fun to put inside of kids' lunch boxes - so healthy, but seasonal too! I wonder if it would be possible to cut it with a pumpkin shaped cookie cutter, spread cream cheese, and close with a second thin slice - like a pumpkin sandwich! I'm soooo trying this for the grandkids! Your pumpkin bread looks scrumptious! So glad to see someone else took the plunge and posted a pumpkin recipe! I love fall! Your pumpkin bread looks terribly moist. Pinning the recipe to keep it in mind! I recently made a pumpkin loaf and I'm itching to continue to bake with Autumnal ingredients and flavours. Also can't wait for the cooler weather. This loaf looks perfect! 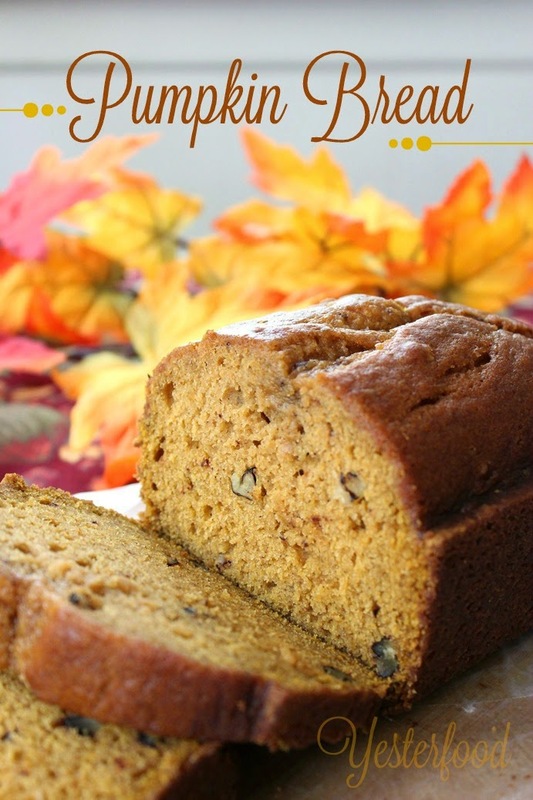 I am in love with Pumpkin Bread --it is my favorite of all sweet breads! I'm not ready to think about fall, but this recipe looks wonderful. Found it at the Thursday Favorite Things hop. One of my favorite parts about August is watching the fall recipes start to appear. And there's no flavor that says autumn better than pumpkin. This bread looks delicious. Thank you for linking at the In and Out of the Kitchen Link Party. Hope to see you again next week. This bread makes me long for fall and cooler temps. I can almost smell it baking. I bet it's heavenly. Thank you for sharing, Joy! So, the only reason I will tolerate the onset of autumn weather is the prolific use of pumpkin. Love this!! I could eat your lovely Pumpkin Bread any time of year, Joy! I can just image in how good it smells when it is baking. Pinned and will share. Thank you for being a part of the Hearth and Soul hop! It looks so moist! I pinned it! I love banana bread! Growing up my mom would make it when the bananas would start to go bad and I loved it! Thanks for the wonderful recipes...I can't wait to try the pumpkin bread! Oh my this reminds me that fall is indeed right around the corner. 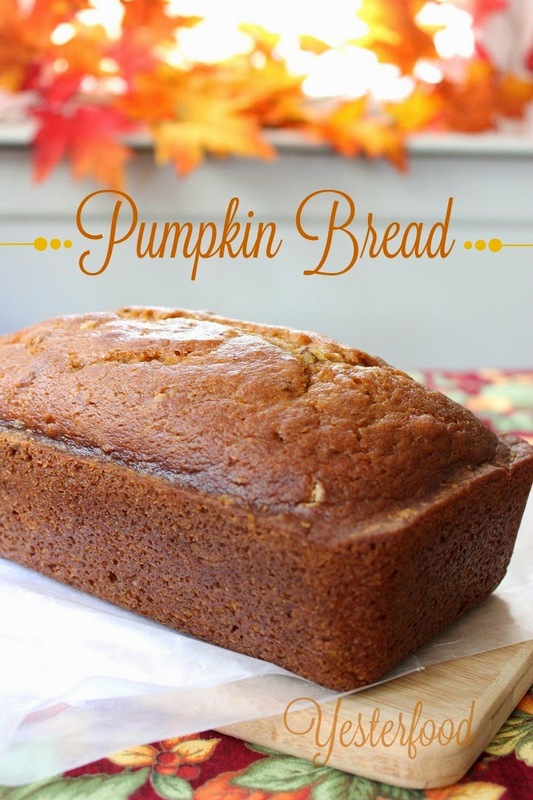 Your Pumpkin Bread looks delicious with warm rich flavors. Thanks so much for sharing with Full Plate Thursday and have a great day! This looks amazing, Joy! I cannot wait for fall and all things pumpkin! Thank you for linking up and partying with us this week! Pinning this! This pumpkin bread looks awesome! I love this type of sweet treat, not too sweet, just right...especially with a cup of coffee! Thanks for sharing! Looks delicious! I am not quite ready for fall baking yet as it is 101 degrees here today! I am pinning this so I will remember to try it out in Sept. or Oct. Thanks for the recipe. G'day! Absolutely gorgeous Joy and thanks for sharing it at our #SayGdayParty! It's funny, I don't care for pumpkin pie or pumpkin cookies; but I love pumpkin bread! This looks super yummy! Thanks for sharing with SYC. I am so ready for fall flavors! As soon as all the garden veggies slow down, I will be getting started! Oh can't wait to try this for the fall. Thanks for sharing at the Bloggers Brag Pinterest Party. Definitely that time of year to be thinking about all our wonderful fall baking! I'd love for you to come link up at my Homemaking Party. Have a beautiful day! I also make pumpkin bread in the fall.,,,our household wouldn't be the same without it! Thanks so much for sharing with the Thursday Blog Hop! Will have to be trying these soon! Yum! I can taste the fall air already. I can't wait! 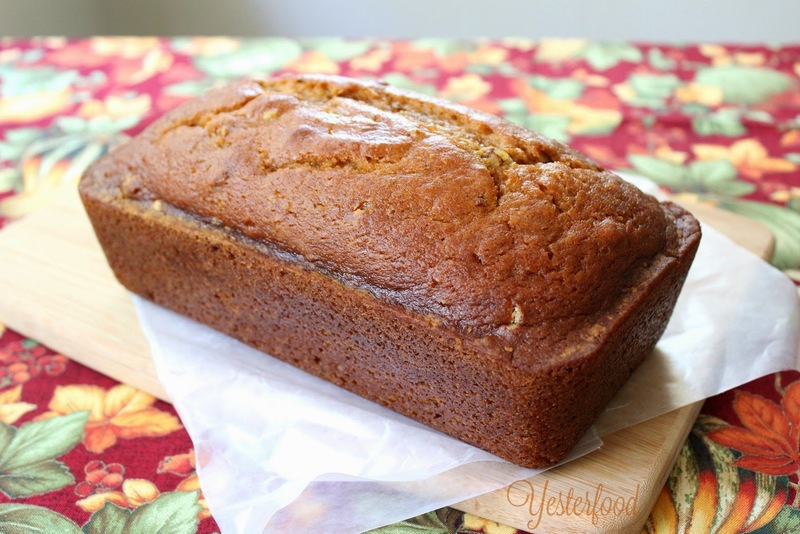 I know it's not quite fall yet, but pumpkin bread has always been one of my favorites any time of year! Thanks for linking up with Creative Spark! I love pumpkin bread I can't wait to try your recipe when fall hits! I'll be a while over here in CA. It's my favorite time of year!! Thanks for sharing at this week's party. Theresa Pinning for later. My daughter has been after me to make pumpkin bread again. It looks delicious! Thank you for sharing at Sharing Saturday! G'day! How did I miss commenting on such a great pumpkin bread? I can almost smell it from here! YUM! I am starting to think Thanksgiving!